Back to the future – this impression can be won by those who take a look at the 2019 motorcycle news. Because the retro trend continues, but there are also electrifying surprises. The motorcycle manufacturers burn off a novelty fireworks in 2019. These include comebacks of legendary machines, new classics from India, and a legendary motorbike brand that gets energized – but overall, the retro look dominates. What can fans expect? One of the most gratifying new releases this year is the Moto Guzzi V85 TT, says Michael Lenzen. “At the Intermot in Cologne last October, the travel enduro of the Italian manufacturer was one of the undisputed stars,” said the chairman of the Federal Association of Motorcyclists. Moto Guzzi praises the machine as “Classic Enduro”. And indeed, the design of the V85 TT reminds of the late 1970s, when Yamaha founded the enduro segment with the XT 500. Also, that the V85 TT with / 80 hp from 850 cc sets a clear sign against the performance delusion of many other manufacturers in this segment, you do not hurt. “A bargain is the Guzzi with around 12,000 euros, however, not,” said Lenzen. Because for 1.550 euros surcharge would get at Triumph with the model Scrambler 1200 XC with 90 hp significantly stronger, nevertheless, with a curb weight of about 215 kg compared to 229 kg even lighter travel machine. As already offered by the Englishman, smaller Street Scrambler with 900 cc, which now but 65 hp and thus makes 10 hp more than before, also sets the 1200s on the off-road look of the 60s. At that time, road bikes were used to move the exhaust a bit higher and put on heavy-duty tires – many a hobby-adventurer was already prepared for a trip across the river and into the woods. In contrast, but also to the Street Scrambler from home, the 1200s Triumph Scrambler not only looks for terrain, but with even two to choose from the terrain driving modes, “Offroad” and “Offroad Pro” the necessary competence actually after. Off-road competence – that goes for the BMW R 1250 GS and R 1250 GS Adventure anyway. “The successor to the R 1200 GS, by far the best-selling motorcycle in Germany for many years, is considered the high-end travel enduro par excellence,” says Lenzen. In fact, the model with 136 hp power abound, but BMW can pay the expensive. “At least 16,150 euros are due, you choose the Adventure variant with a larger tank and more travel, it is even 17,700 euros,” said the industry expert. And with special equipment and accessories can easily break even the 20,000-euro sound barrier. Such superlatives have always been foreign to the Kawasaki W800. At just 48 hp, the parallel Twin modeled on the Triumph, BSA and Norton engines of the 1960s was always designed for deceleration. Great was therefore the grief of motorcycle nostalgics, as the Euro-4 emission standard and the lack of ABS, the W800 end of 2016 put into forced retirement. Now the machine is back. “Of course, with ABS and Euro 4. Suitable 90 percent of the installed parts to be new, according to Kawasaki,” explains Lenzen. The W800 is offered as a street version and as a cafe version with a small cockpit panel and hump seat. Two other machines are in the tradition of British two-cylinder. No wonder, after all, Royal Enfield was originally an English company that has been building motorcycles since 1901. Royal Enfield has been in Indian hands since 1984 and has so far built only single-cylinder models. But now the Indians have remembered the two-cylinder tradition of the then still English brand in the 1960s and 1970s. With the Interceptor 650 and the Continental GT 650 come two classic models, which are technically with four-valve technology and overhead camshaft on the amount of time. 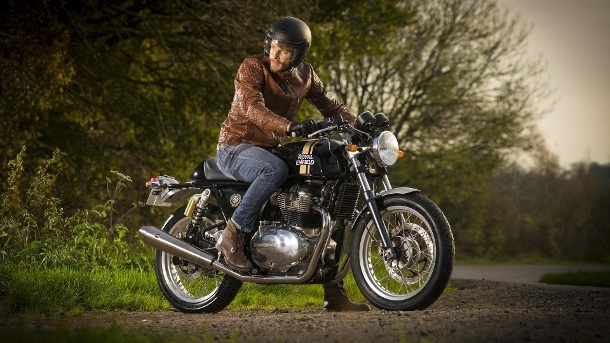 “While the Interceptor with double seat and a slightly higher handlebar allows an upright seating position, makes the Continental GT with bump seat and clippers on Cafe Racer,” says Lenzen. “Otherwise, both models are absolutely identical.” 48 hp are always suitable for relaxed cruising and are priced around 6,500 euros comparatively cheap. The Husqvarna Svartpilen 701 sports an avant-garde interpretation of classic flat-racer racers. The single-cylinder engine is technically based on the 690 Duke of parent company KTM, makes 75 hp and costs 10,195 euros. The revived Suzuki Katana features three more cylinders and twice as much power with 150 hp. In the early 1980s, the Japanese succeeded in creating a design icon with the original. “The Katana seemed almost like a science fiction movie,” says Lenzen. Almost forty years later, the Japanese are now working on it with the new Katana built on the solid technical basis of the GSX-S 1000. A price is still not known, so Lenzen, but assumes that Suzuki calls a little more than the 12,395 euros, which costs the GSX-S 1000. For this money you would almost get the new Honda CB 650 R and the already known CB 300 R on top of that. With the 650, the world’s largest motorcycle manufacturer is closing the gap created in the Neo-Cafe Sports series between CB 1000 R and CB 300 R. The four-cylinder bike with 95 hp should cost around 8,000 euros. Much more expensive, the Harley-Davidson should be Livewire. The first e-bike of the American brand is expected to roll to the dealers from late summer. Up to 177 kilometers far the e-bike should come with a current charge. From 0 to almost 97 km / h, the Harley should make it in less than 3.5 seconds. Due to the electric drive neither clutch nor gearbox are required. There is also something new from another American traditional brand: “With the Flat Track Replica models FTR 1200 and FTR 1200 S, Indian is introducing a series beyond the cruiser segment for the first time,” explains Lenzen. The very sporty pace designed bikes afford 120 hp and cost from 14,690 respectively from 15,990 euros.